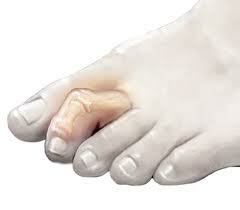 A hammertoe deformity is a contracture of the toe at different joints. There are three joints at which a contracture can create a problem. It occurs due to a loss of mechanical advantage of the small muscles in the feet, which control the stability and motion of the toes. Painful corns can occur over the toe at the area where the toe “buckles”. The corn is in response to excessive pressure on the joint. The pain is associated with pressure on the underlying joints. In diabetics, or people with poor circulation, hammertoes can be a serious condition. Infections can ensue and the hammertoes can become the source of loss of limb. Treatments can include regular debridement and padding of painful corns; splinting of the toes and custom molded orthotics to retain mechanical advantage to the small muscles in the foot. In most cases, ultimate correction of the deformity is achieved through minor outpatient surgery.